At the school where I teach, I attend chapel five days per week. Four of those days it is a brief service where we sing hymns, recite prayers, and listen to a Bible reading followed by a sermon. On the one other day, we have a full service complete with Communion. This may sound like an awful lot of worship, but it is actually a really nice reflection time for both the students and teachers halfway through the day. Recently our priest showed a YouTube video entitled If You Give a Little Love, You Can Get a Little Love of Your Own. I found this short video to be quite moving as it demonstrates how a simple, kind action that you unwittingly make can really affect others around you who you might not have known were watching. Quite honestly, after viewing this video, I did incorporate one small change at school. You see, we have a faculty lounge where there are three coffee urns, which I think is a nice perk! I tend to frequent this coffee bar, late morning and once again late afternoon to put a little more pep in my step. If I am pumping the coffee urn, and it runs out, of course, I automatically make another pot. Comparatively, if I dash in to grab a cup of coffee, and the urn is standing their empty, I moan and groan about the audacity of some people. Who? I really don't know nor do I care. I just silently berate them in my head. Now, due to this video, in an effort to be more selfless, I am making more coffee regardless if I was the one who caused it to run out. This is my own personal contribution that could possibly be causing other people to do good too! I like to think it is. Subsequently, where does the Milt Dog factor into all this? Well, this Saturday, June 1st, will be an exact year since we brought our puppy dog into our home. It is a very special day for all three of us. Milton has really changed our lives for the better, and after hauling him to daycare, vet visits, and countless walks, I really do feel a lot more selfless. That brings me to this photo. When my mom visited, she "delighted" in watching Milton swim. Whether or not she thought a dog swimming was truly amazing, I am uncertain, but I know that she was delighted because Jeff and I are wild over Milt, and she joins in that excitement for us. Her sweet disposition affects us and makes us happy too. Kindness begets kindness -- I just think it is a good lesson for us all to remember and one that Milton teaches me everyday! Fine...I'll watch the video to learn to be more kind. BTW, I'm a very mean person and I revel in my nastiness. Kinda like the Grinch on steroids. Funny coincidence; this morning I arrived at the office before most other employees only to find - AGAIN - the burners on the coffee machine on with two empty carafes just sitting there gathering the heat and waiting for someone else to make the coffee. Don't people know what happens to glass when it gets super-hot and has no insulation? So yes, I left a nastigram taped to the coffee pot, made coffee in the only cool carafe left, and walked away. I will rewrite my note in a kinder, softer manner and go hang it right now. Thank your mother for a lesson learned. When I read this post while on my way to work, I burst out laughing! At least I am not the only person who runs into these problems...! 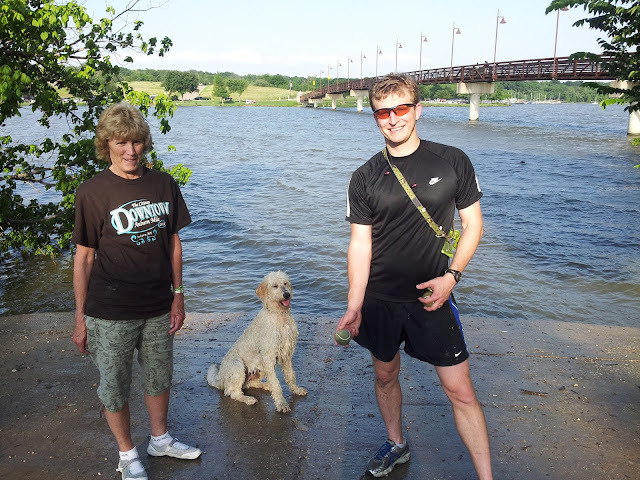 Heidi didn't mention, and unrelated to the above post, that Milt had jogged 5 miles to get to the dog park to meet with Gran-Nan and swim. He is quite the athlete these days. FIVE MILES?!?!??? You two....are GODS!